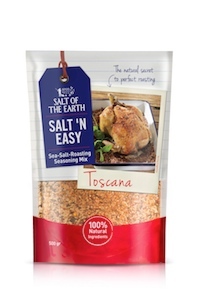 Salt-N-Easy from Salt of the Earth is the chef’s secret to roasting vegetables, poultry and fish. An all-natural, exotic, clean label blend of coarse sea salt and spices, the product is positioned as a food enhancer. Salt-N-Easy has the ability to absorb heat and dissolve it effectively during roasting, meaning dishes stay moist and juicy, without adding fat or oil.